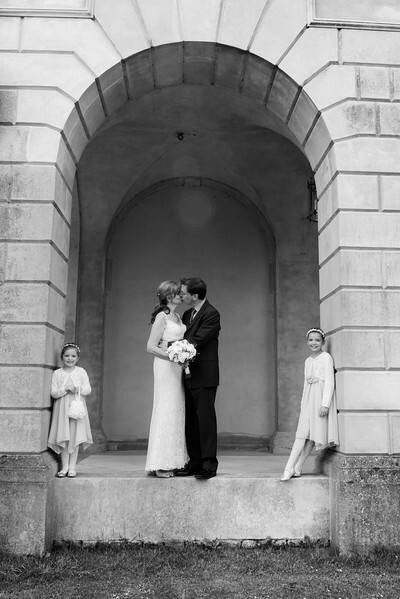 We always always always love photographing at Cliveden! It is so beautiful and there is such a wide variety of places to take our brides and grooms, and it always feels so luxurious as a location. I don’t think we will ever tire of photographing there, there is always something new to discover. We have done weddings where the bride and groom have hired the whole of Cliveden on an exclusive basis, and we’ve done more intimate affairs with just close family. Claire and Mark’s wedding was a mixture; a really special day with close friends at the ceremony in the registry office in Beaconsfield, just their parents and their children for the wedding breakfast, and then a huge party in the evening. As the saying goes, there was a lot of love in the room, with Claire and Mark’s young daughters so delighted to see their parents get married. The girls even gave speeches during the ceremony – completely sincere and heartfelt and made everyone cry! The friends who came to the ceremony, then went back to the house to decorate it for the party. It was a really special day.